Posted by Brittany Bosher on Thursday, July 30th, 2015 at 10:20am. 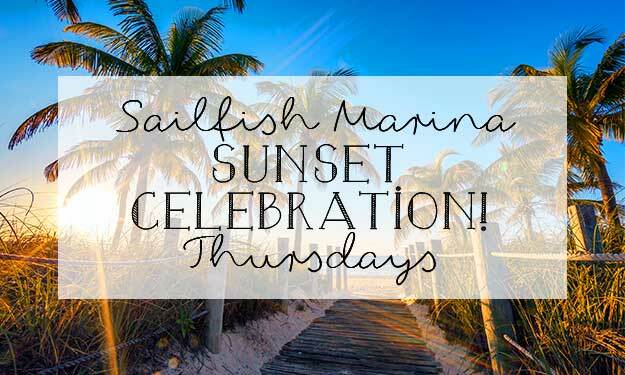 Taking place at the iconic Sailfish Marina on Singer Island, is the Sunset Celebration. Every Thursay evening you can walk along the sunset lit marina to see local artists, vendors and their products. From unique blown glass to wooden sculptures and pottery, silver and gold jewelry all set up along the backdrop of the water and beautiful peanut island! Another special event taking place at the Sunset Celebration, www.sailfishmarina.com, are the live musicians, like the amazing Clark Rodriguez, signing and playing his guitar. You’ll hear sounds of your favorite Jimmy Buffet inspired tunes or steel drums playing on the boardwalk as the sun sets colorfully in the western sky. You or your little ones might also spot lazy pelicans bobbing around in the water hopping to catch a scrap of fish food some amber jacks were too slow to scoop up. Amongst this idyllic Floridian location, on Singer Island, people come from all over to browse the many artists that come from as far away as Seattle, WA to exhibit their craftsmanship and artistry. The Sailfish Marina Resort offers a classic South Florida setting of fresh seafood restaurant and yachting marina. The restaurant faces Peanut Island on the Intracoastal Waterway and just south of the resort is the Lake Worth inlet. There is plenty of seating area inside, as well as outside; to watch all the boats cruise by. There is not a bad seat in the house. If a sit down dining experience isn’t in the plan for the night, the restaurant sets up a stand along the waterfront selling their famous “Grouper Dogs” and delicious Conch Fritters! It’s the perfect place for a casual tropical night reminiscent of Old Key West. Stroll the docks, take in the art, enjoy the music and you’ll be sure to find treasure here. The Sunset Celebration is the perfect showcase to what life on Singer Island is like. Whether you buy some art or just browse, stop by on any Thursday evening at sunset. Bring the family, even the family pet on a lease is welcome and don’t forget to feed the fish off the docks! Don't miss tonight's Sunset Celebration!! !